Are you someone who just absolutely loves cooking? Or do you know someone who does, and for whom cooking is one of their favorite hobbies? If so, then check out some of these creative and adorable Christmas ornaments themed around cooking and food. 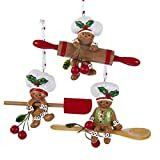 You'll find everything from miniature pots and pans to busy little S'mores angels baking up a storm for the holidays; there are a lot of fun and fabulous ornaments available. 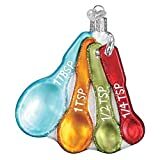 Maybe you could even do an entire tree in a food-and-cooking theme...I'll share some more ideas for that below along with my picks for some of the coolest cookware Christmas ornaments available. These ornaments would be fun for a professional chef, or perhaps someone who aspires to be one, someday! Maybe you've got a son or daughter in culinary school (or planning to apply to one), or have a family member who dreams of being the next "MasterChef" or "Chopped Champion". If so one of these is sure to be a delightful surprise. 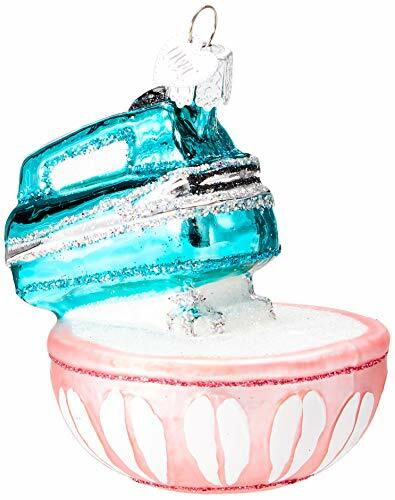 A beautiful blown glass ornament with hand-painted details. Made in Germany, this lovely ornament comes in a gift box perfect for gift-giving and keeping safe for years to come. 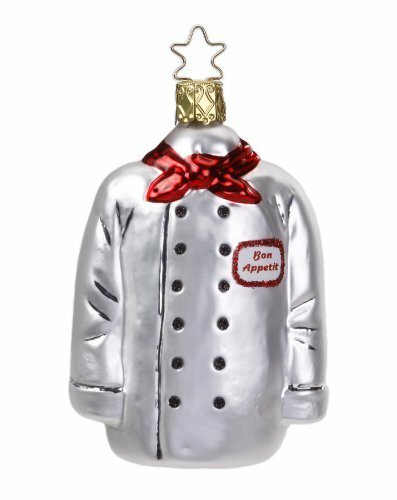 A perfect companion to the chef's jacket ornament, made by the same glass company from Germany. Part of the "Delicious Forever Christmas Ornament Collection". 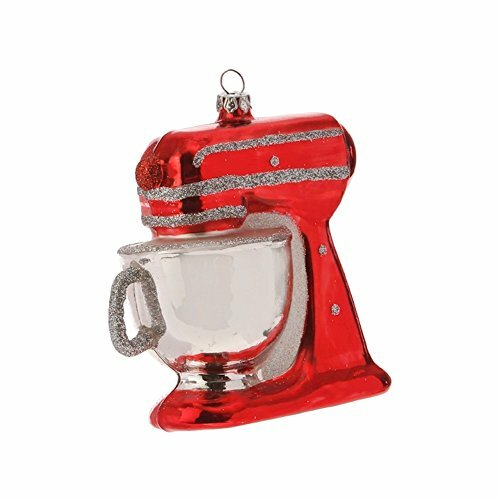 This proud chef is the master of her kitchen in this super-cute ornament! 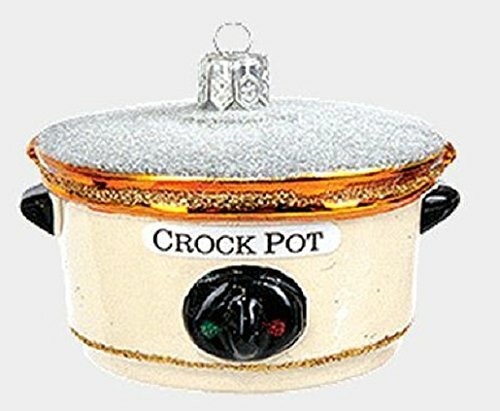 This funny ornament is perfect for whomever is the master chef/host of your family's Christmas gatherings. 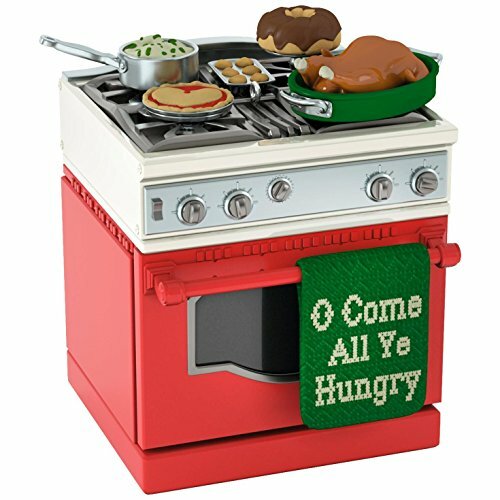 It's an old-fashioned stove-top/oven loaded up with holiday meal favorites: a roast turkey, muffins, pie, cake...and mashed potatoes? This one is sure to get a laugh if you gift it to the busy home cook in your life. Who is the "Top Chef" in your household? Me! I'm the best cook in the family. My partner. I love it when my sweetie cooks for me. One of my parents. No one can beat my mom's (or my dad's) cooking! One of my grandparents. Nothing beats grandma's meatballs! One of my children. She/he didn't get the gift of great cooking from me! 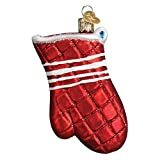 What's so cute about this ornament is the neck "ties" on the apron serve to hang the ornament on your tree! Decorated with glitter, it will sparkle and shine under the tree lights. 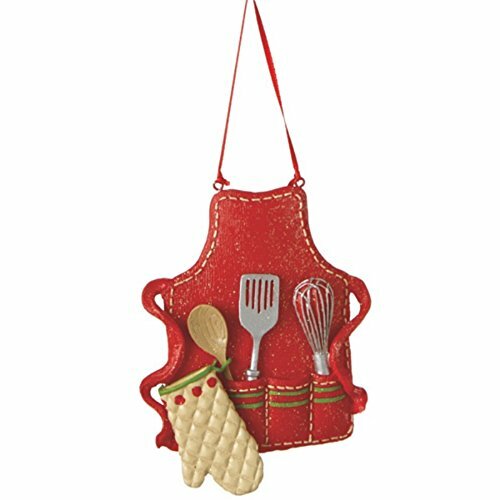 This apron is well-stocked for cooking with a mitton, spoon, spatula, and whisk accessories. How about Christmas ornaments made of food? Ditch the plastic, dollar-store ornaments this year, and decorate your tree with homemade, edible creations. Learn how to make a wide variety of Christmas ornaments using simple foods! Luckily you can create your own tree ornaments with ingredients already in your kitchen cupboard. It takes a little effort to make some of these ornaments but it's a heck of a lot cheaper than buying them in a store. 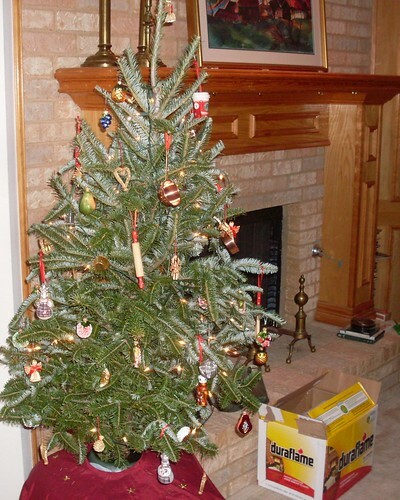 Dress up your tree with all of those kitchen utensils, cookware and appliances that you can't live - or cook - without! It looks like a cast iron skillet...but it's really made of glass! 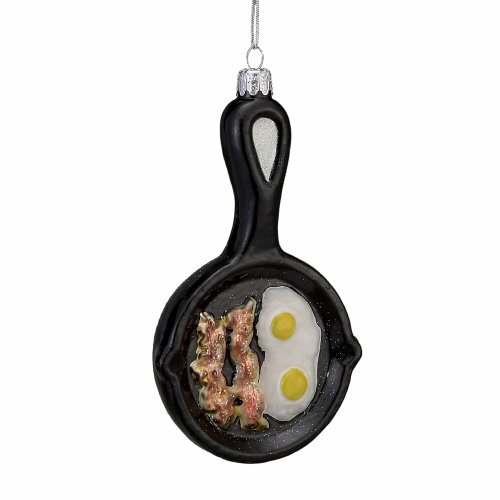 A wonderful collectible ornament complete with tasty looking bacon and eggs. 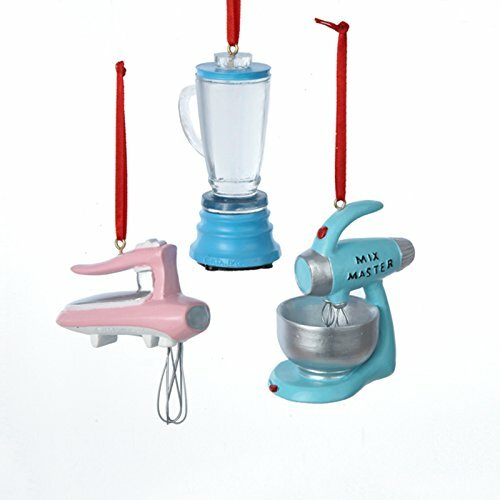 An adorable set of vintage-looking blenders and mixers in pastel colors. Includes one of each...perhaps it will remind you of cooking in your mother or grandmother's kitchen when you were younger. Or it could be perfect for anyone who loves vintage-themed items and decorations, too! Made of resin, these ornaments are sturdy and will provide years of decoration enjoyment. If those vintage mixers just wasn't doing it for you, check out these two sparkly ornaments! Each features a different style of more modern mixer made of colorful, bright glass. One is a hand mixer, complete with colorful mixing bowl. The other is a large electric stand mixer in brilliant red. Which does your chef prefer? Baking! Making sweets, pastries, pies and cookies are the best. Cooking! Making savory dishes, dinners and meals is his or her specialty. 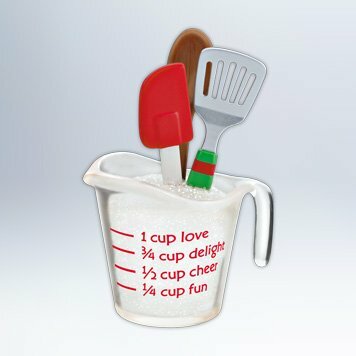 A measuring cup full of flour usually = lots of delicious Christmas treats! Made by Hallmark so it's perfect for collectors. 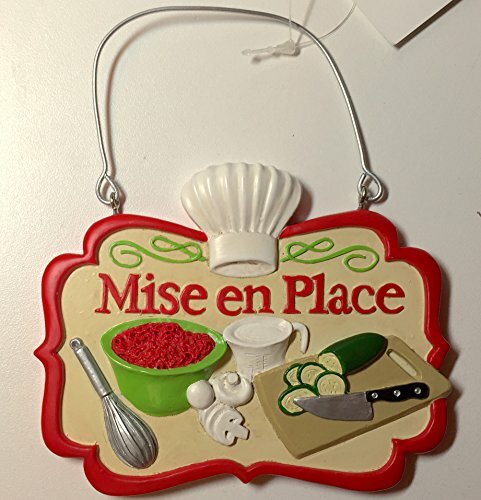 Midwest Cook's Christmas Ornament "Mise en Place"
A good home chef knows all about the concept of "mise en place" - everything in its place. That means preparing all of your ingredients and keeping them organized and handy before you begin to cook, to make it all go more smoothly in the kitchen. 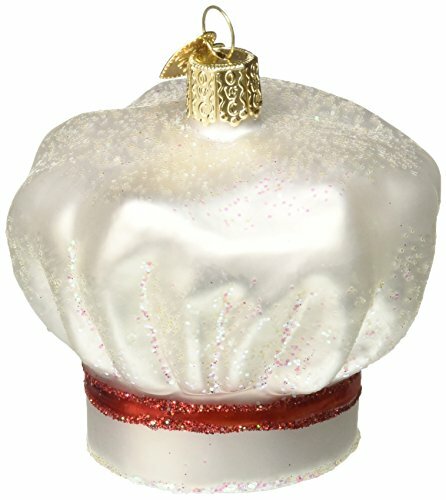 This cute resin ornament is quite large (4"x3") so it will stand out well on your tree. A great gift ornament for the serious home cook. Maybe you know someone who is a little "too" obsessed with their slow-cooker and tries to cook everything in it. If so, they should definitely get a kick out of this ornament, made of brilliant, mouth-blown glass. 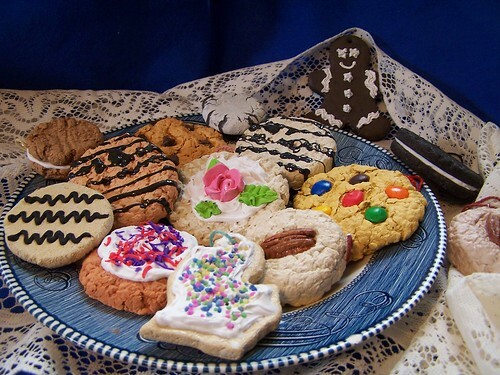 Homemade Cookie Ornaments? Why not! Edible candy ornaments, popcorn garlands...there are other ways you can bring a chef's touch to a Christmas tree besides the ornaments shown above. Check out these YouTube tutorials for great ideas and inspiration. What's the Recipe for a Happy Christmas? 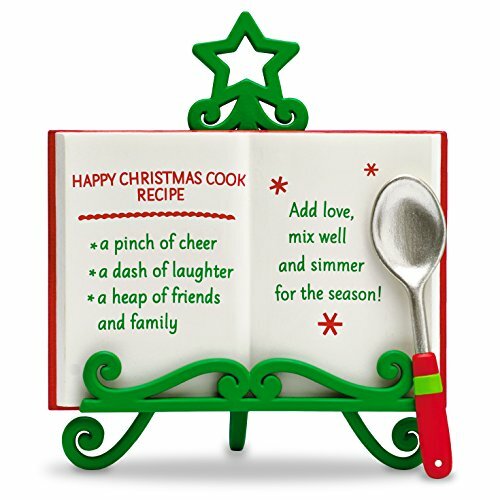 According to this fun ornament, it's "a pinch of cheer, a dash of laughter" and a "heap of friends and family". Of course, having a really good cook in the kitchen fixing up holiday treats doesn't hurt, either! ...But Don't Forget a "Pinch of Love"! 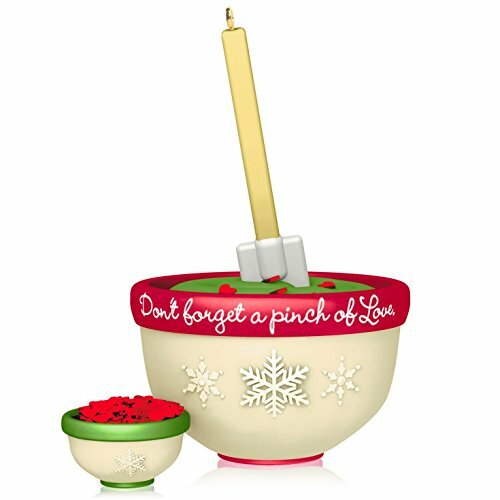 Stir up the holiday cheer with this mixing bowl ornament, all done up in Christmas colors of red and green. I'm not sure what they could be baking up in those bright colors, but it would still make for a fun decoration for your Christmas tree! A "Kitchen Tree" can be a fun idea for a cooking enthusiast! This super easy ornament is easy to make and just takes one ingredient - peppermint candy! Get this all-star, easy-to-follow Hard Candy Ornaments recipe from Patrick and Gina Neely.